Here For The Ride is Andre D. Wagner’s first monograph and comprehensive body of work in print. Exploring the poetic side of everyday life, the book chronicles people of different ethnicities, cultures and social groups, as they embark on a personal journey through the New York City subway. Made up of sixty-two photographs that are intended to be read more than viewed, Here For The Ride is a collective sequence alluding to the qualities of life that are often invisible to the common eye. What started as an approach to kill the mundaneness of commuting between Brooklyn and Manhattan soon turned into a three-year journey through the New York City subway. Rather than attempting to depict all subway lines and boroughs, Wagner focused on photographing his personal journey in transit. 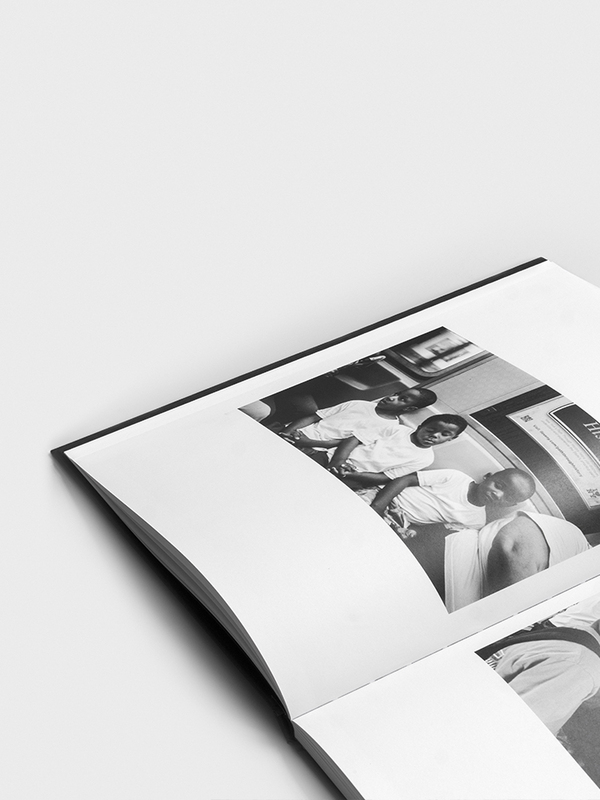 Containing two interrelated documents, the hardcover book contains the primary photographic narrative, consisting of 100 pages and 62 photos. The paperback includes an essay that examines the photographic work in the book, an in-depth interview with the artist and a series of images that delve deeper into the artistic process behind book. The first edition of Here For The Ride is limited to 750 copies. Each copy comes with a numbered certificate, verifying the originality of the work. Dimensions: 21,1 x 29,3 cm, Pages: 100 pages + covers, Printing: Duotone offset, Paper: 150 gsm. coated paper, Binding: Casebound with a special debossed tip-on image on the front cover. Dimensions: 21,1 x 29,3 cm, Pages: 32 pages + covers, Printing: Duotone offset, Paper: 130 gsm. uncoated paper, Binding: Stapled. Features a special fold-out cover, as well as a 8-page gatefold with contact sheets. Andre Dwayne Wagner (b. 1986) is an American photographer residing in Brooklyn, New York. His photography explores the lyrical and poetic side of daily life, using city streets, people, public transportation, and the youth of the twenty-first century as his visual language. Originally from Omaha, Nebraska, Wagner's practice includes developing black and white negatives and making silver gelatin prints in a traditional darkroom. Here For The Ride is Andre D. Wagner’s first monograph and comprehensive body of work in print. Exploring the poetic side of everyday life, the book chronicles people of different ethnicities, cultures and social groups, as they embark on a personal journey through the New York City subway system. The first edition of Here For The Ride is limited to 750 copies. Each copy comes with a numbered certificate that verifies the originality of the work. © 2017 Creative Future. All rights reserved.